The request for dinner tonight was simple: Beef, it's what's for dinner. I didn't really have anything in mind so I clicked over to Simply Recipes to check Elise's recipe archives and see what she might have for beef recommendations. 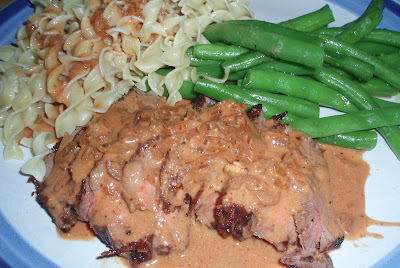 Scrolling down my eye was quickly drawn to a recipe I remember drooling over awhile back, Heidi's Steak Diane! Steak Diane is tradtionally made with a thinly pounded steak, and a cognac, butter, and shallot sauce that is flambéed right before serving to great dramatic effect. 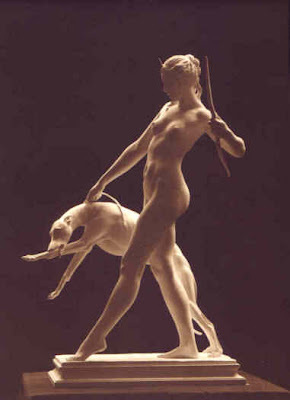 Doing some research into Steak Diane, I found that the "Diane" part refers to Diana, the Greco-Roman goddess of the hunt, and "a la Diane" sauces were typically served with venison and game meat in centuries past. It was probably New York hotels that popularized the flambéed steak version. 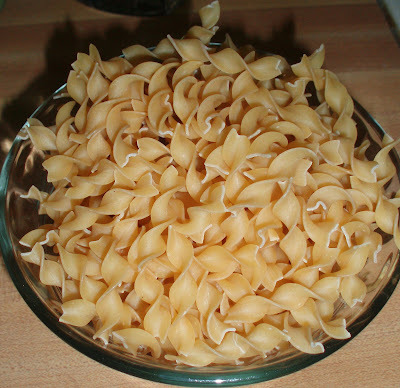 Here is the recipe that is posted on Simply Recipes with a few small changes. The main difference was the cut of beef. I went with a 12oz flank steak, a perfect amount for the two of us. The other change was the cooking...I cooked the steak on the stove top the entire time, removed to a warm plate when cooked to the desired doneness, then continued on with the shallots in the same pan. There was plenty of extra sauce so it went on noodles...enjoy! 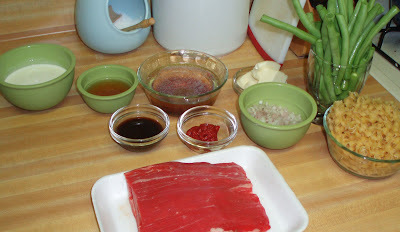 1 Whisk together broth, Worcestershire sauce, mustard and tomato paste; set aside. 2 Start preparing the steak. Sprinkle salt and pepper on both sides of the steak. 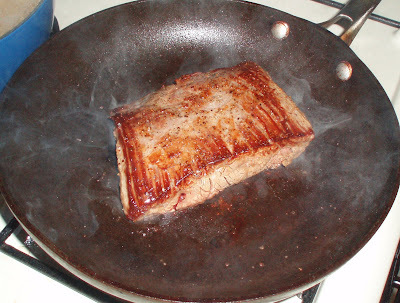 Heat oil in a skillet, add the steak and increase the heat to high, seareach side for 3 minutes, cook an additional 2 minutes per side on medium high heat. Remove steaks to a warm plate. 3 While the steaks are resting, in the same pan as you cooked them, sauté the shallots in butter for one minute on medium heat, stirring constantly. 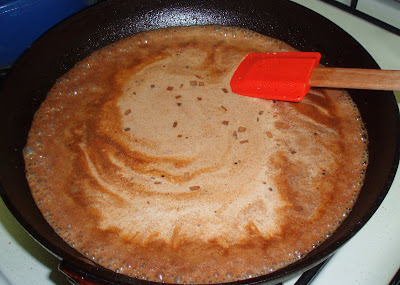 Carefully add the cognac to deglaze the pan. (this is alcohol and will flare up if it gets near the flame.) 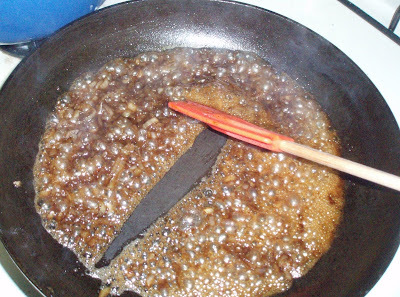 Increase the heat and cook until the cognac is almost evaporated. Stir in the broth mixture and bring to a boil. Let simmer for a minute. Stir in the cream and cook for two more minutes. 4 Thinnly slice the flank steak to serve. Drizzle warm Diane sauce over the steak on each serving plate. All the ingredients are ready. Except the mustard which I nearly forgot! 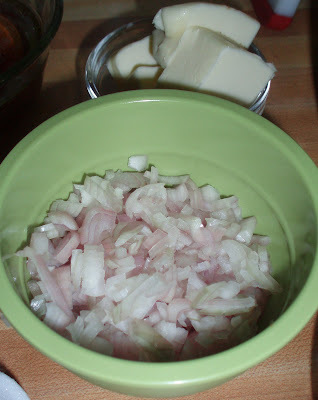 Finely chopped shallots! I love shallots and would use them in almost every meal if I could. Far superior to onions and garlic in my book! 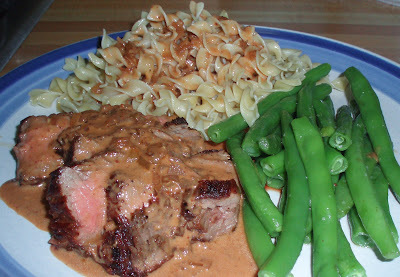 I served the Steak Diane with thin egg noodles. 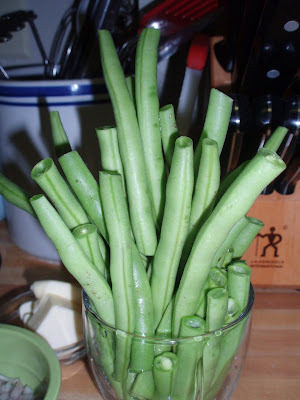 And blanched green beans that I quickly sauted in some olive oil. My flank steak. I actually cut it in half, half way through the process, it wasn't cooking through and was all sorts of smoky. After the booze was added and allowed to reduce. 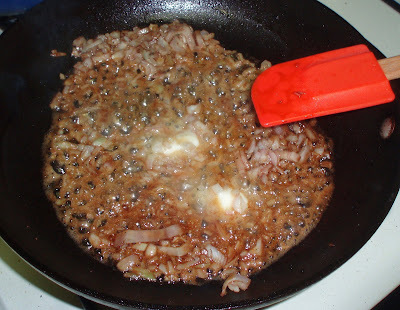 The mixture was nice and thick, and very dark in color, a deep dark carmel color. The broth mixture and cream added; simmer. The plate! Sauce on the steak and a little drizzled on the noodles. A very delicious, well-rounded meal. You might think the beef would taste heavy, but it doesn't. Having it thinly sliced really makes all the difference. This is lovely! 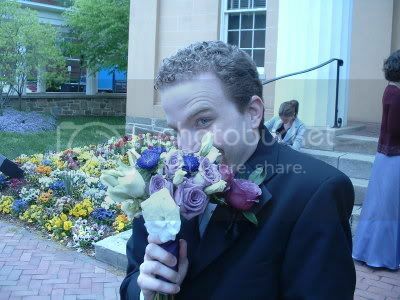 And looks so yummy. I haven't made Steak Diane in years so thanks for the reminder!